Gor Mahia’s 2017 season has started on a poor note. 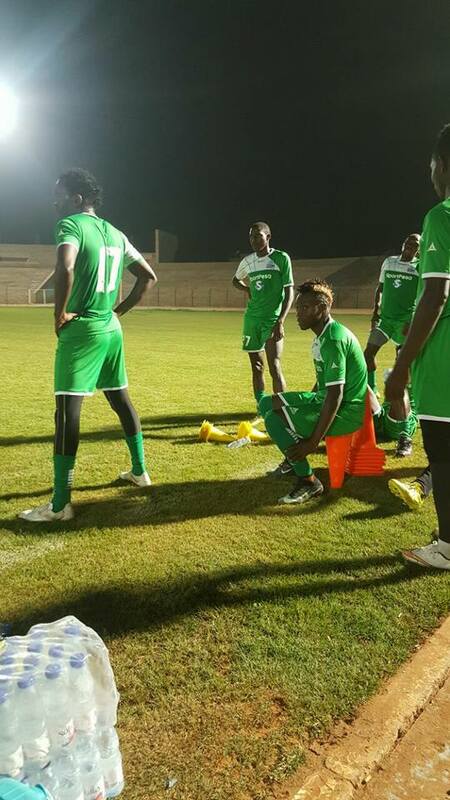 The club has played two colourless matches, losing to Al Hilal of Sudan 0-1 and then to Thika United 1-2. The losses have set alarm bells ringing among club officials and fans. Coach Ze Maria is already feeling pressure from fans. However Chairman Ambrose Rachier has turned his focus on the players. “Gor Mahia is a good club that is loved by many and we shall make sure that you get the necessary support. I urge you to work hard because the standards keep rising and we have to match up to expectations,” said Rachier to the players according to the club site. Nevertheless it is not time to panic yet. In 2015, Gor Mahia played poorly in the pre-season matches including surprise losses to Bandari and a dramatic 3-0 loss to Zambian side Power Dynamos. Gor Mahia went on to win the league unbeaten. I think Rachier has said what I think. The gives instructions and the players execute the plan. However the opponent also does the same. So it is upon the players to work extra hard to get results. Ze maria still believes tiki taka will deliver trophies on kenyan soil ? Not sure about that. @ jathur GI, none of this new players are established players . history has shown that whenever we recruit more than 10 players in a season , only 2 or 3 live up to the expectations therefore expect majority of this new signings to be offloaded in June or December …that is the reality ! I am responsible only for what I say, NOT what you understand. Jomoko dwa baro wi ji kae!!!!!! Gor Mahia fans in this blog platform, kindly give room for divergent opinions regarding our team. Let us not opt for craniotomy (head surgery). Look, Musymo is already in agony. Hehehehe@BB, otek ma small. What some of us forget that the purpose of this blog is for us to post our opinions and being that we are of different psychological persuasions and world views, we will always post divergent views. There are people seemingly so used to deciding everything said in their households, when is is said and how it is said. They are so afflicted by this disease, they carry it to this blog forgetting this blog is bigger than their spouses and kids. Let us post our views, disagree but we will never allow anyone to police what we say!!!!! Amen I can’t agree more and to set the record straight the the previous post I talked about “getting value for money”. Never did I mention money in relation to what someone is paid! These two are are different as day and night. I keenly followed the whole of last season and in my opinion which is contrary to what many people have written here, we didn’t lose the title because of the Tusker points. The boys played like they always do but we lost because we never played at Tok Komwanda. The three previous seasons we were winning most matches at City Stadium and that was the biggest contributor to us winning nothing. City Stadium is normally a fortress and many opponents find it hard but Nyayo is open to any team taking points. Nyayo is never good especially with low numbers of fans as witnessed last season. If we are not going to play at City, it will be a struggle like last season. Nothing to do with Ze Maria’s methods but everything to do with better support from fans. Donning the green jersey comes with very high expectations. It therefore follows that the players raise their game a notch higher and sacrifice for that badge they wear. However,all teams want to slay the green army and make a name for themselves. So, its how we rise to such challenges that will determine how far we go this season.All the best to the team!! @musymo, i cant agree more with you, as fans we need to focus on how we can get the best out of the team we have, this can be either through compliments when they deliver and constructive criticism when they fail. And to me the team is the EC+TB+PLAYERS. Most players who leave Gor Mahia tend to look ordinary in other teams. Why? Precisely because of the support accorded to them when they put on the Green Jersey. The current team ‘on paper’ looks far better than the Siang’a team and i believe with better support this season, the boys will make it and carry this club higher for the coming 3 seasons. Gor is a big club and whoever cannot withstand the pressure to warm the bench and join tusker with approx 50 fans.Hatutaki kuumia kama mashabiki .Pep may not last more than a season in city, futball is about results not lame excuses. Exactly let them hold their horses. Let us see how long Pep, Mourinho will last if they don’t win the league,FA,or qualify for UEFA and consequently perform well in UEFA.League cup the equivalent of Top 8 does’nt count for much. Remember the fate of the likes of Van Gaal. Mr Chairman it is good that u have sensed danger , expect even poorer results when the legue starts for some clubs like sony sugar who only spend 10k in the whole transfer period to recriut players will give u hard tym simply because ua tacticians are clueless . Recruit a practical coach not a guesswork coach like the one u have . Your archrival Ingwe have done it this time round wait and see. It is said the grass is usually greener on the other side but the antithesis is also says the bills are also higher there. It is too early to begin expressing confidence on what the opponent is doing at the expense of one’s own. Football is like a marathon. Requires training for endurance. The results will be evident.